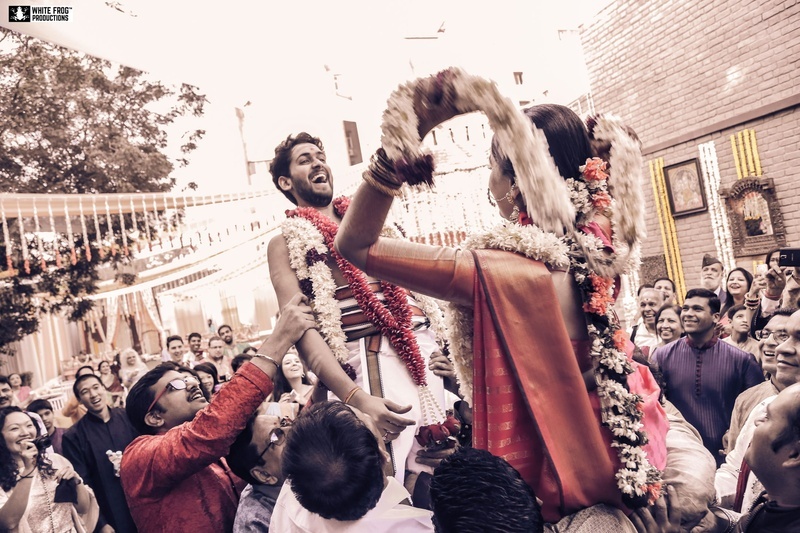 South-Indian Wedding Held At R.K Puram, Delhi with the Cutest Bride Ever. 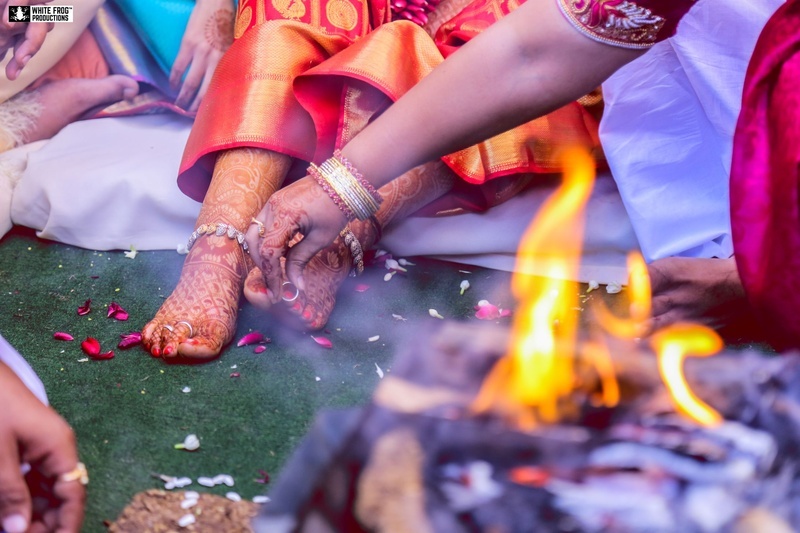 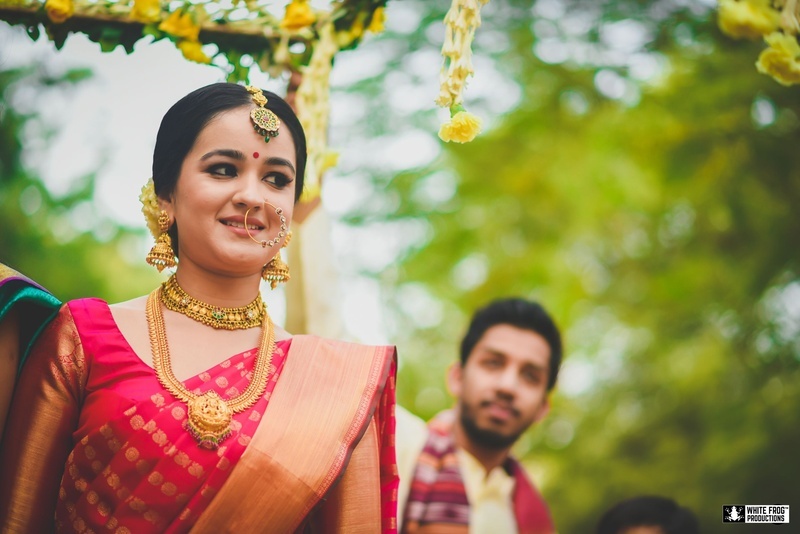 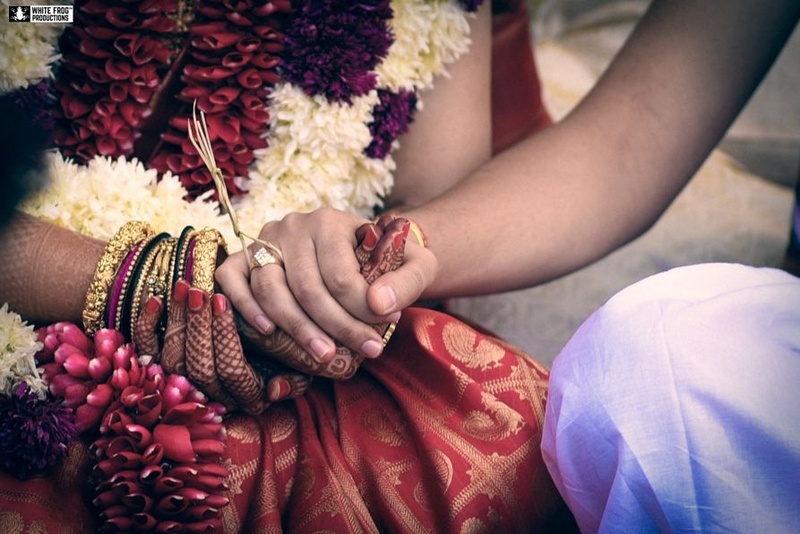 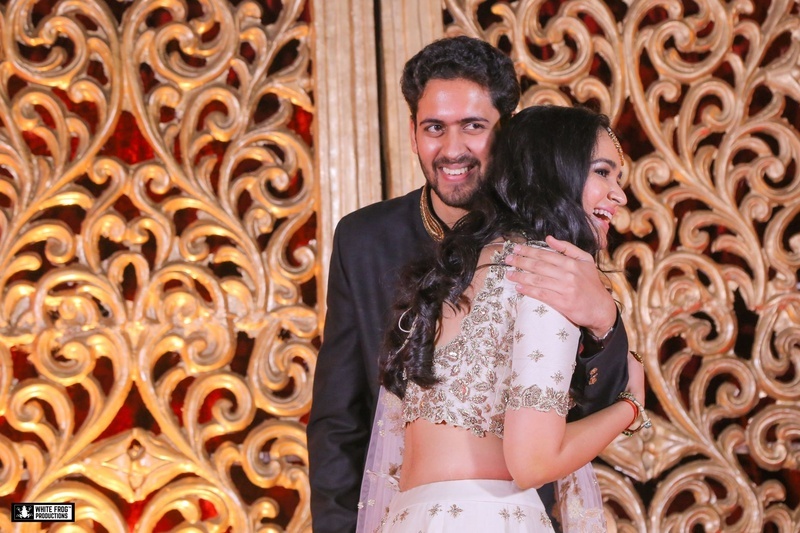 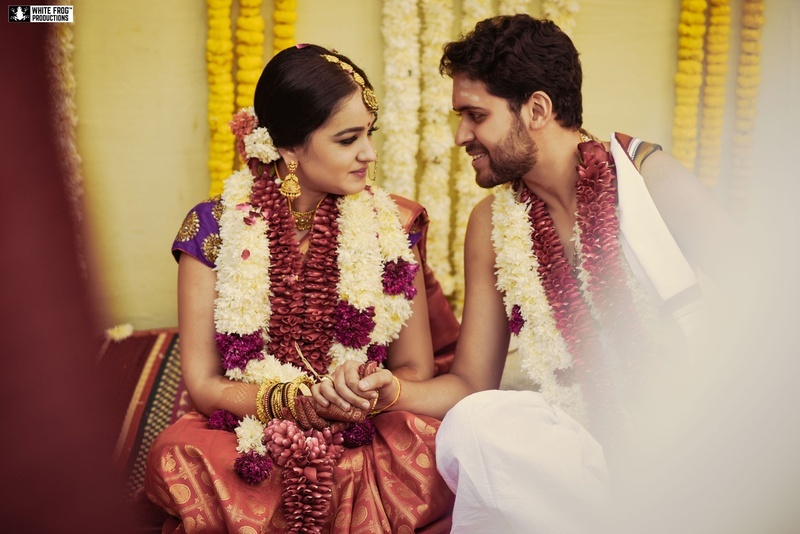 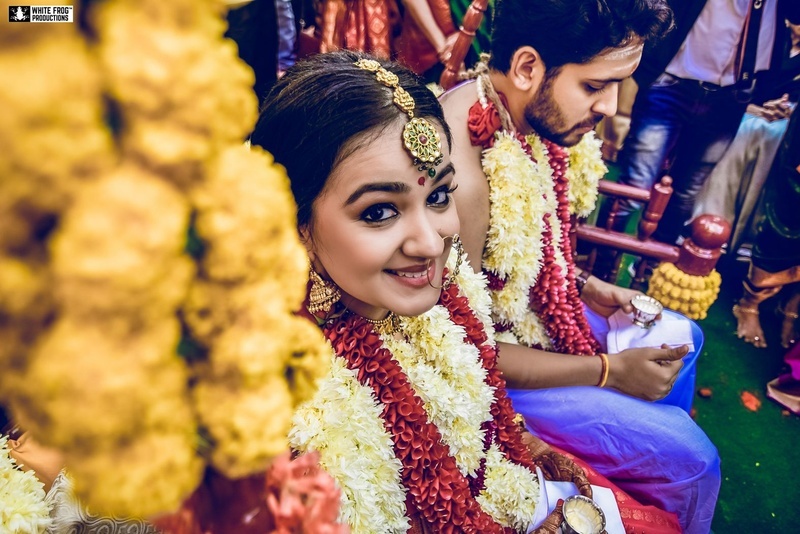 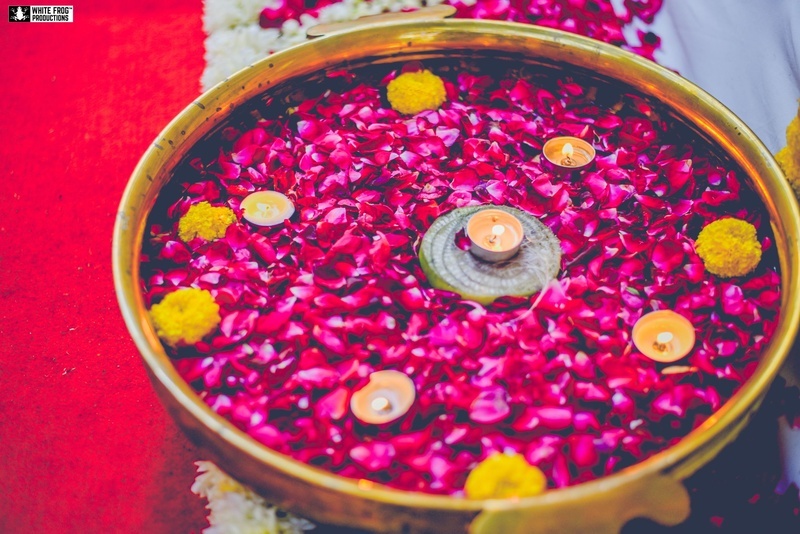 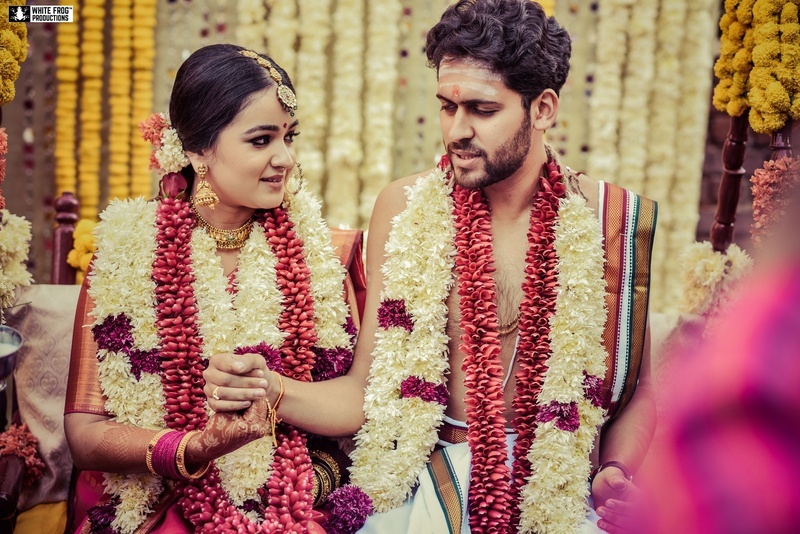 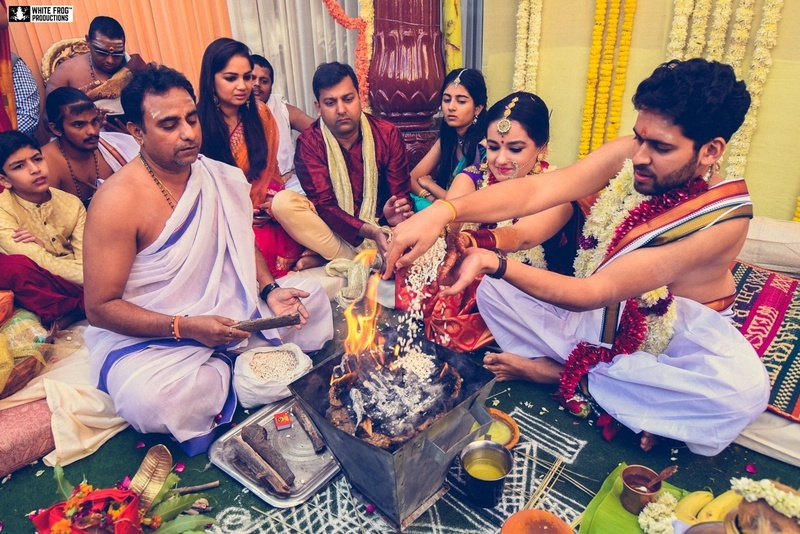 We would want to name this South Indian Wedding as a “cute-affair”, courtesy, the bride. 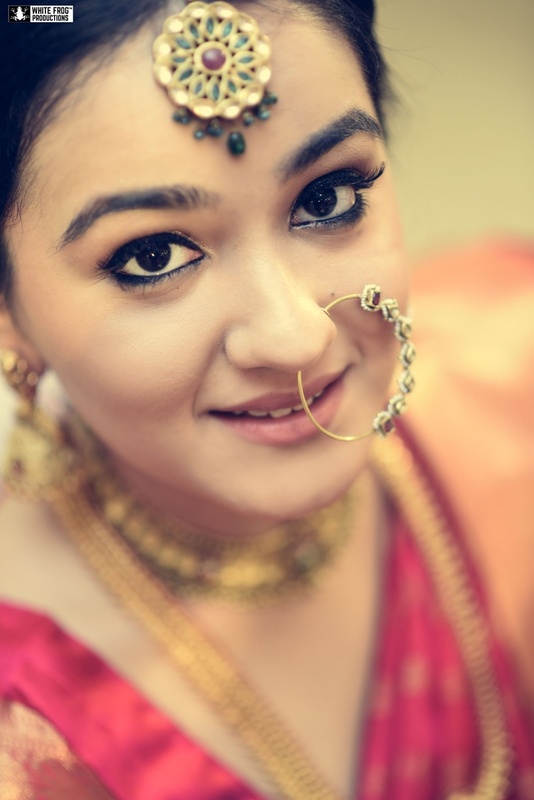 With minimal makeup and an elegant nath, Aakriti would have surely won the title for the “Cutest Bride Ever”. 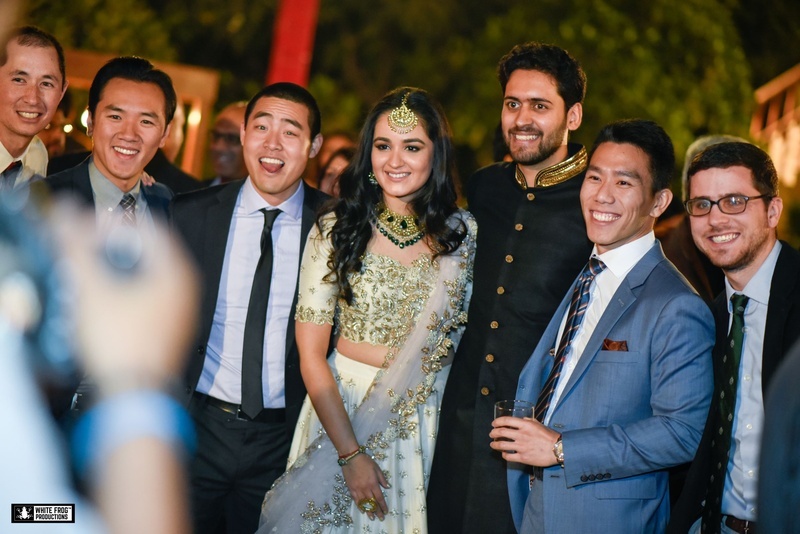 On the other hand Rajeev contributed to the hotness level. 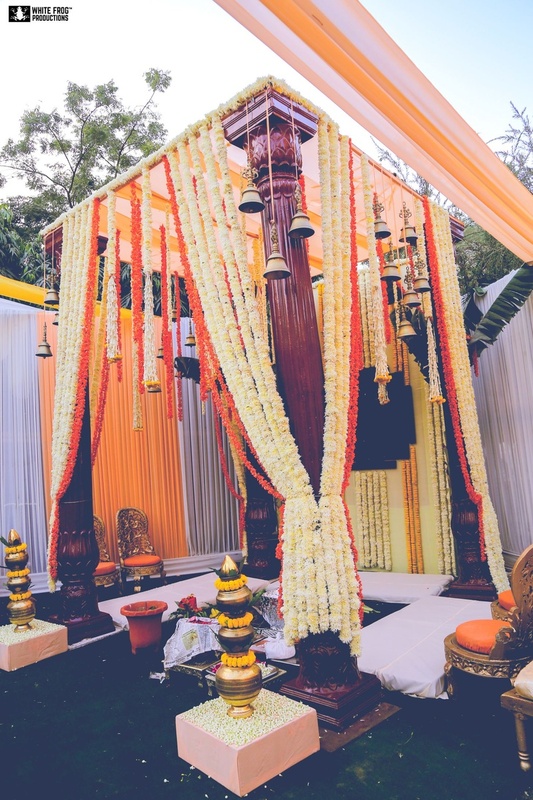 Another thing that caught our eye was the different setting for different ceremonies, making this wedding colorful and vibrant. 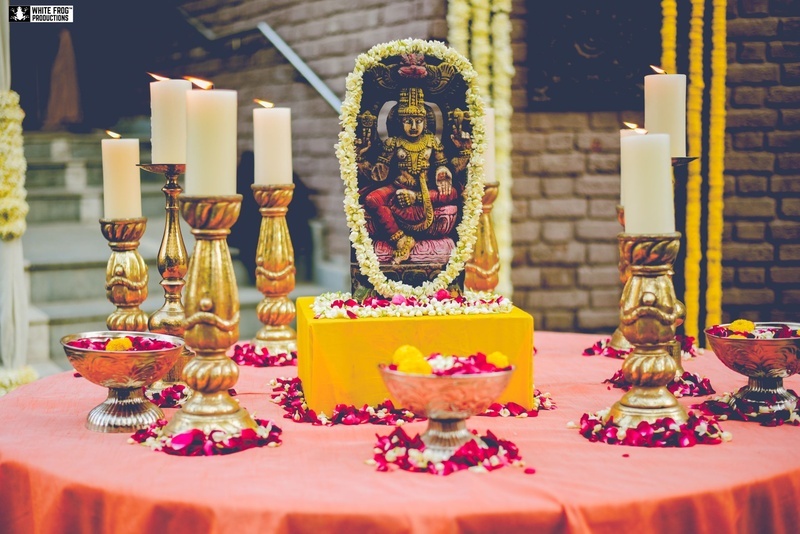 The floral themed mehendi had a very modern feel while the sangeet had all the desi ‘latke-jhatke’. 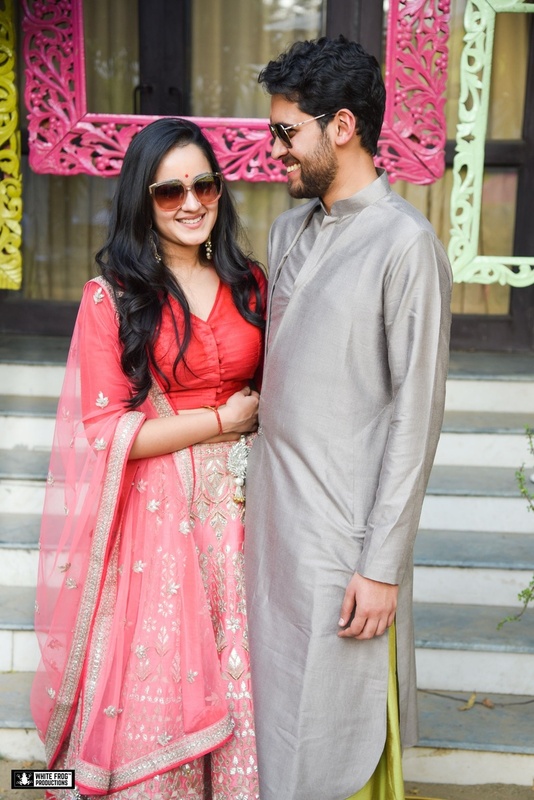 Akriti wore a pastel pink lehenga paired with a reddish pink blouse for her mehendi ceremony. 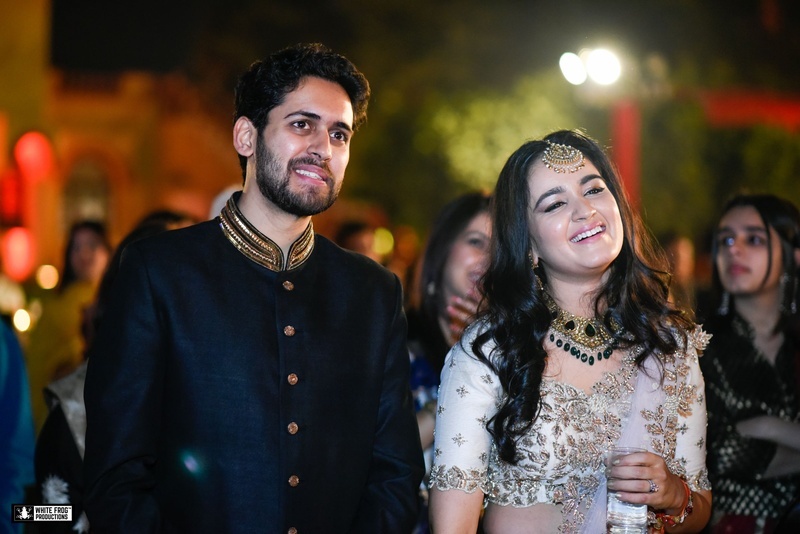 Complementing each other with color coordinated grey and pink outfits. 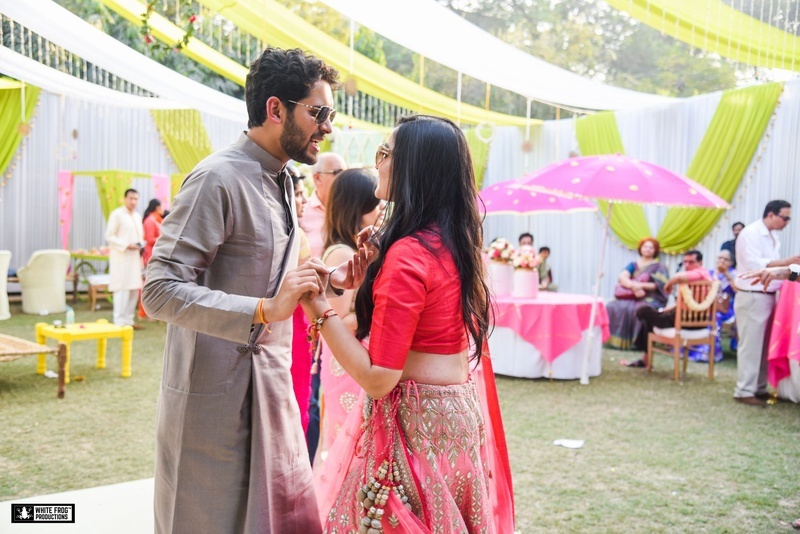 Twirling around in a pastel pink gota patti lehenga at her mehendi ceremony. 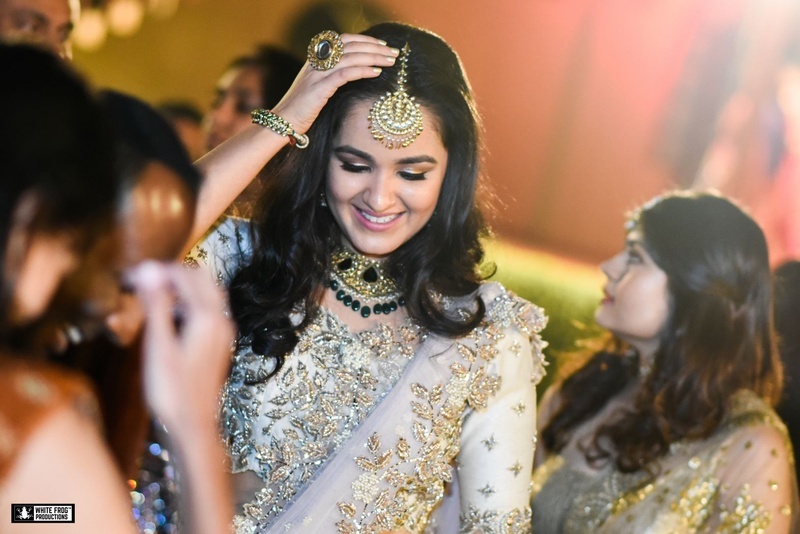 Looking pretty and dazzling in a white lehenga with heavy embroidery for her sangeet ceremony. 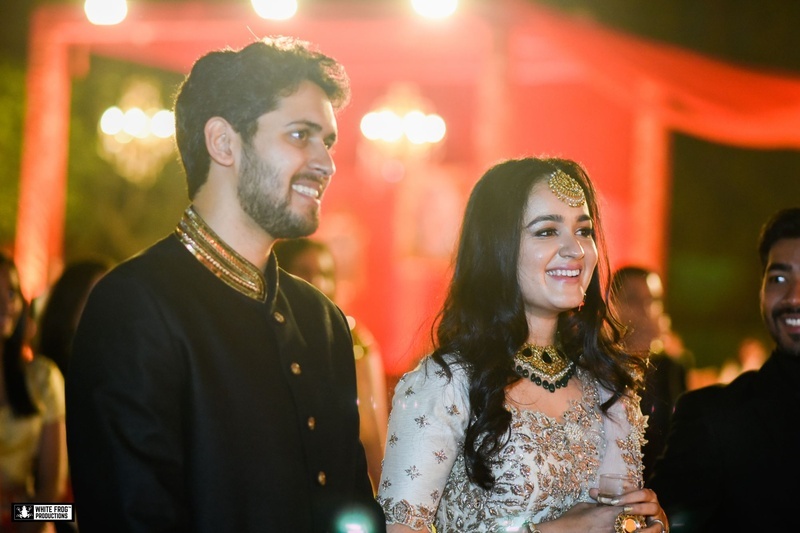 Complementing each other with black and white outfits! 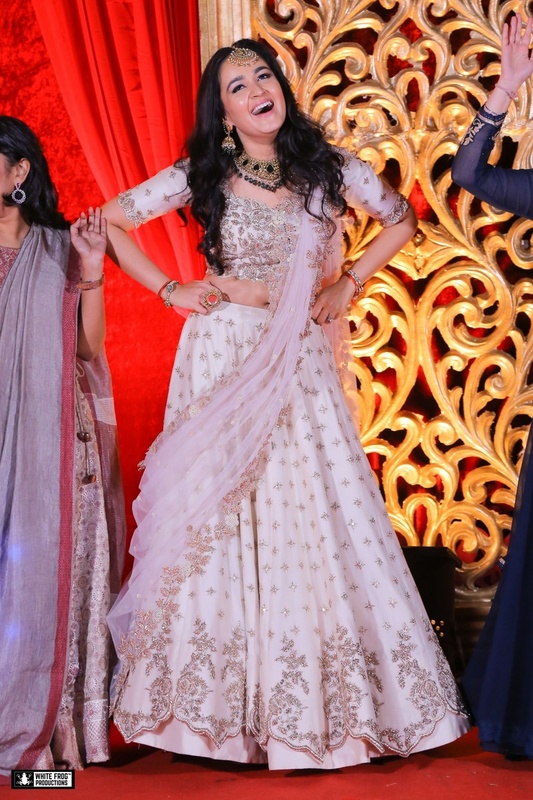 At a dance perforamnce at their sangeet ceremony. 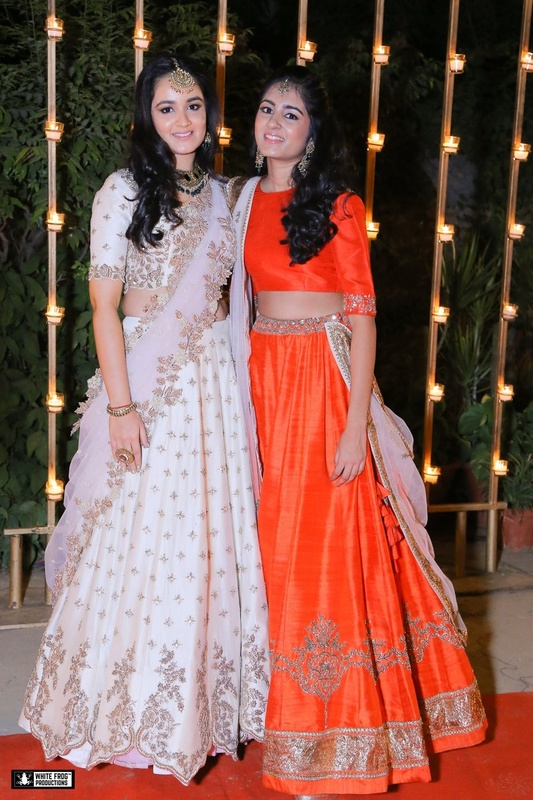 White and pastel pink lehenga with silver embroidery styled with minimal makeup and jewellery for sangeet look. 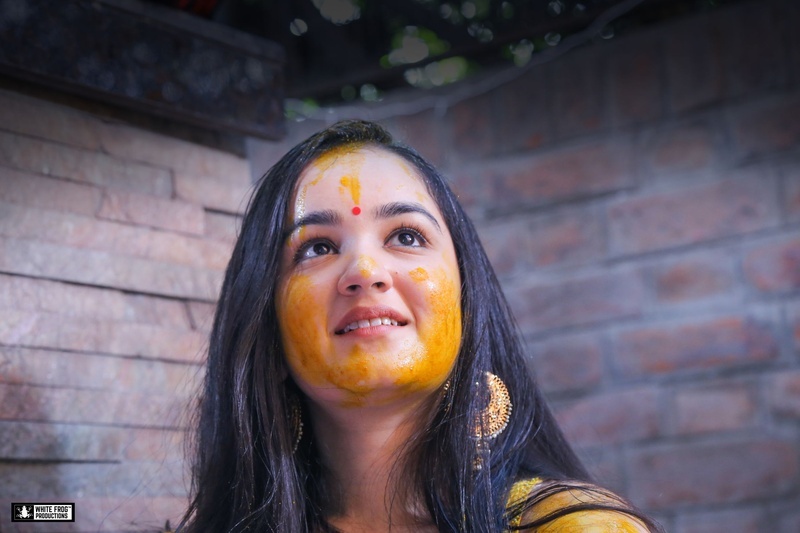 Adorable brideat her haldi ceremony. 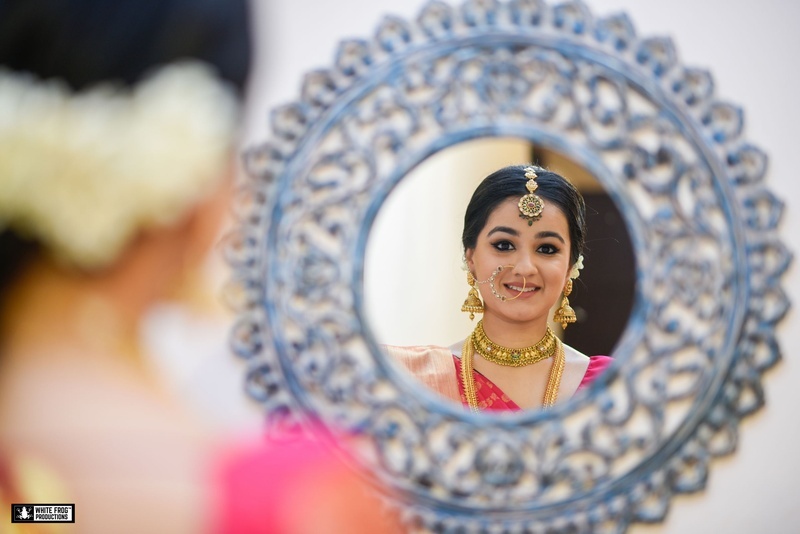 Adorable south-indian bride getting ready for the wedding. 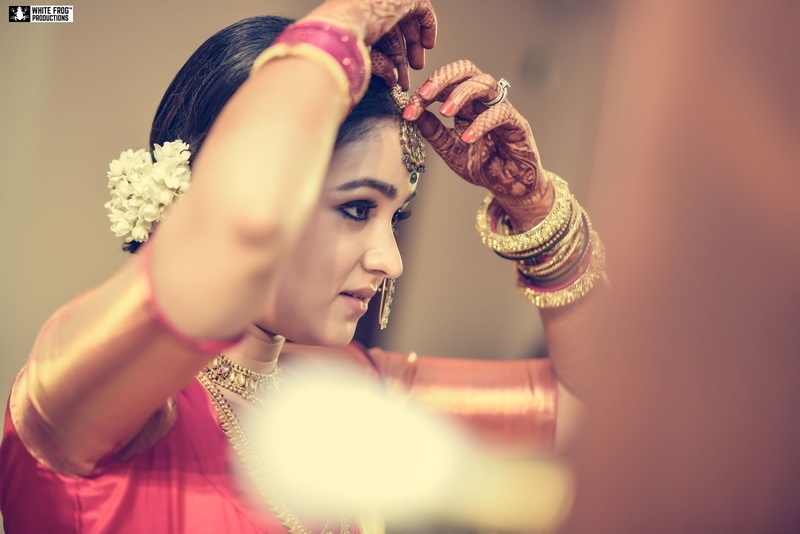 Adorned in beautifully minimal bridal jewellery. 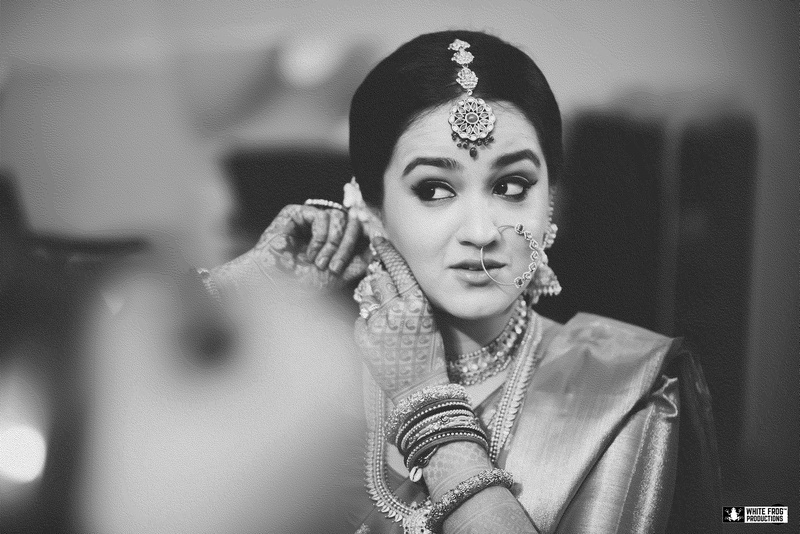 Black and white bridal shot by White Frog Productions. 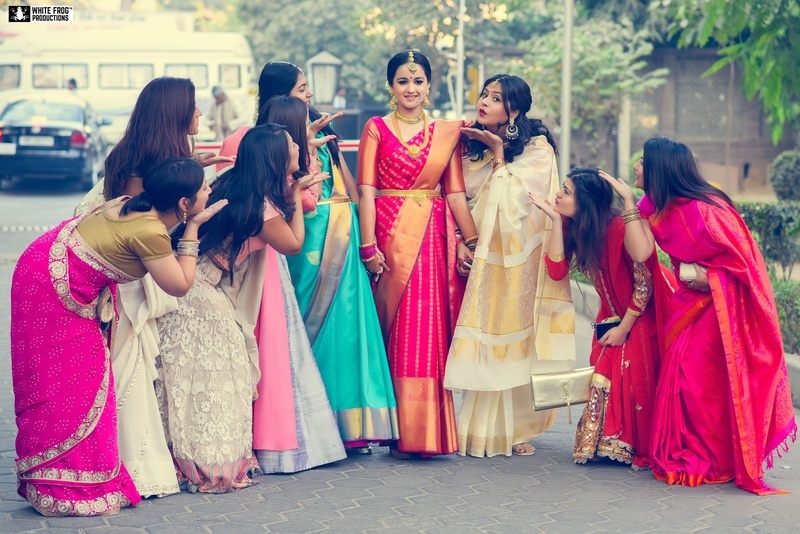 Aakriti and her bridesmaids . 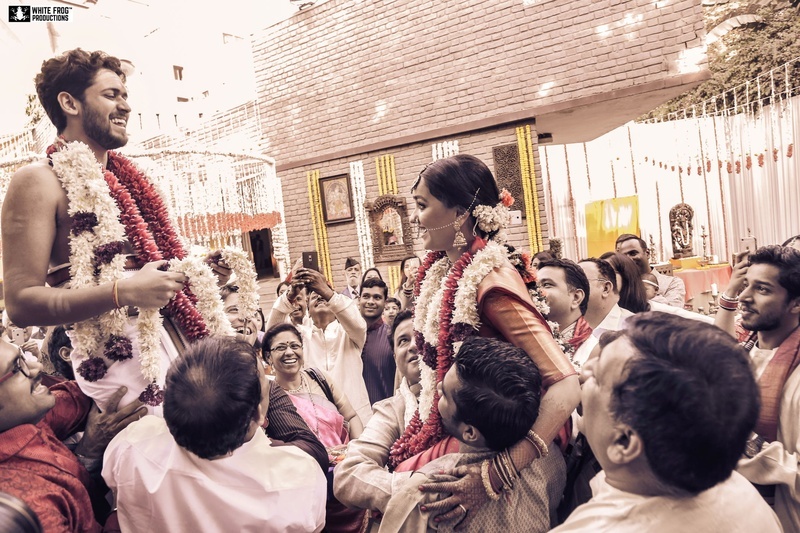 Bride and groom photography by White Frog Productions. 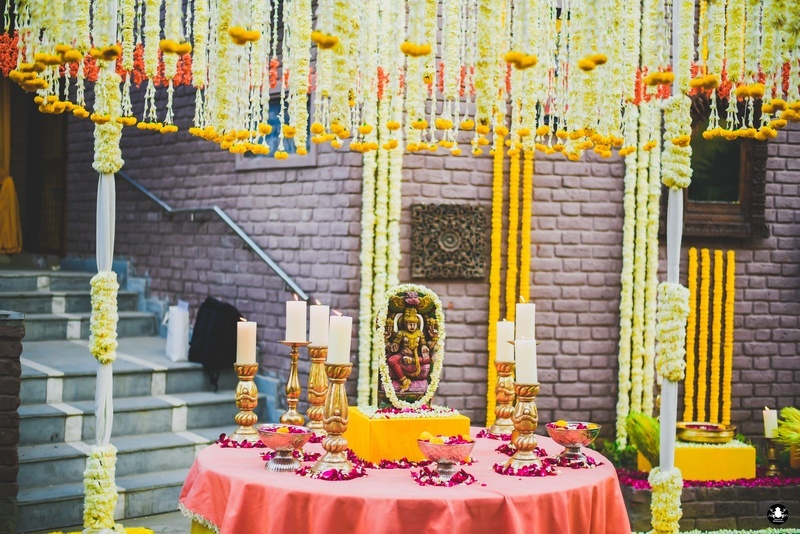 South Indian wedding set-up at R.K Puram, Delhi. 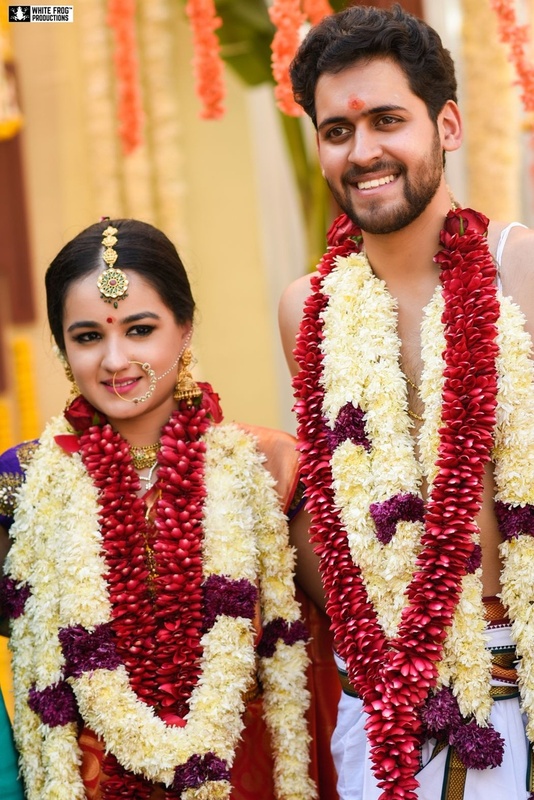 Adorned in a heavy flower garland. 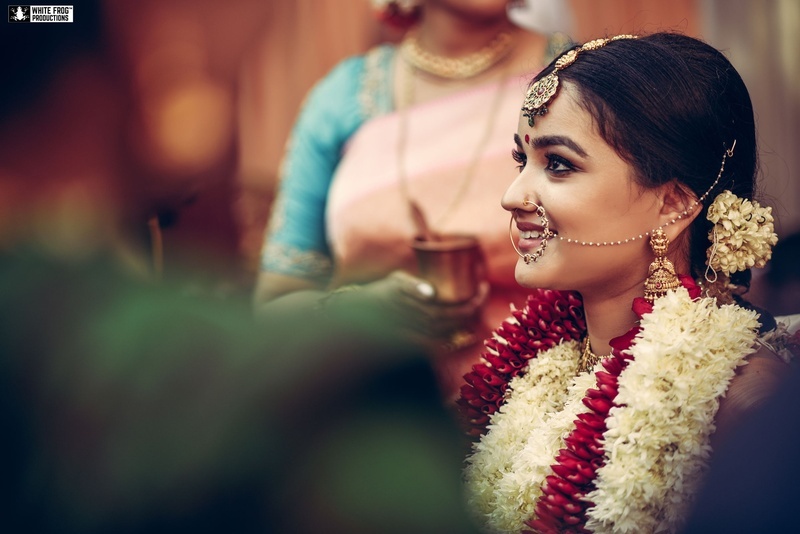 Looking dazzling in very minimal bridal makeup and jewellery. 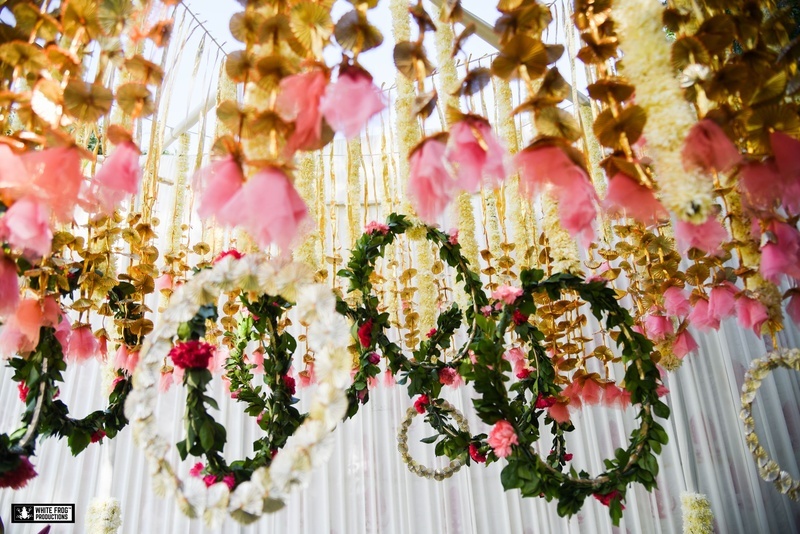 Genda phool decor for the Soth Indian wedding. 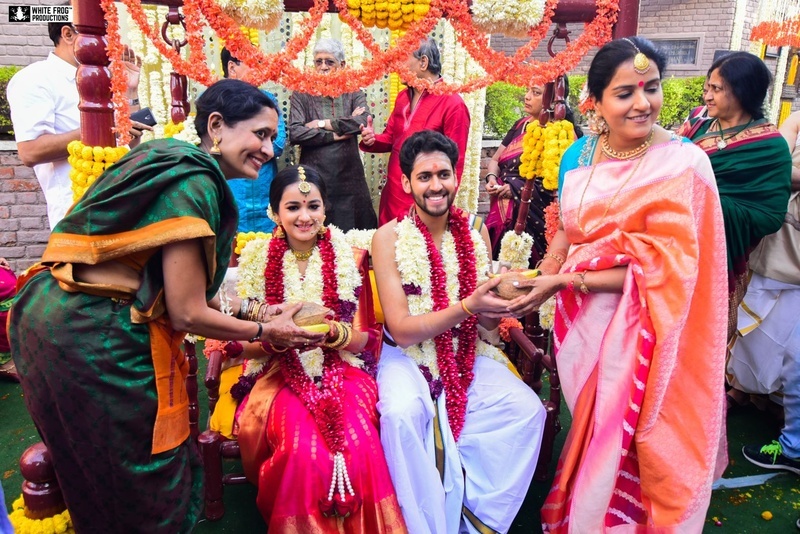 Bride and groom at wedding ceremony.